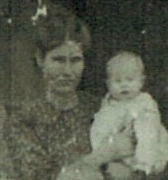 Comments: Della Jones (Nee: Beck) | Centrahoma OK USA | 1901-1920 | Comments: Cropped from a group photo with names & place listed on back. Many Beck brothers & sisters married Jones brothers & sisters. Many are in this photo taken around 1908.